Appalachian Theatre, November 1938. Image courtesy of the Sams Family, the Appalachian Theatre of the High Country, and Digital Watauga. 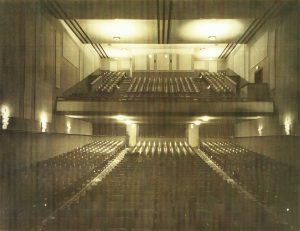 The Appalachian Theatre was built in 1938 by W. Ralph Winkler and A. E. Hamby based on a design by a Lenoir architect, Clarence P. Coffey, but it was not the first theater in Downtown Boone. Film exhibition in Boone went back to at least March 7, 1905, when a traveling showman projected films in the second (1875) Courthouse in its final days as a working public building. Moving to the new 1905 Watauga County Courthouse, occasional picture shows by Jack Campbell and others followed until 1919, when Clarence Ellis and O. L. Coffey operated a more regular service under the “Appalachian Theater” moniker from July 1919 through the summer of 1922. In 1937, Hamby and Winkler purchased a house lot on the south side of West King Street owned by E. N. and Blanche K. Hahn. Here, working from plans by Clarence P. Coffey of Lenoir (the same architect who designed Cove Creek School and the 1968 Watauga County Courthouse), Hamby and Winkler erected Boone’s newest movie house, which they in turn leased in September 1938, along with the Pastime, to a father and son team from Statesville, A. Fuller Sams and A. Fuller Sams, Jr., who operated a chain of theaters known as the Statesville Theatre Corporation. 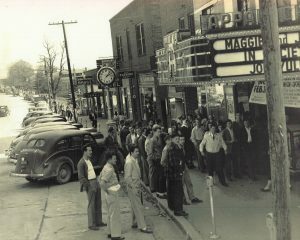 When finally opened on November 14, 1938, the new theater took on the old Appalachian Theatre name, while the Pastime remained as Boone’s B-movie house. 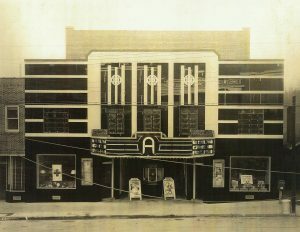 The two-story movie palace was likely the first Art Deco building constructed in Watauga County, sealing its reputation as a stylish venue in a town whose architecture offered little variation. Its original front façade was brick covered almost entirely with decorative, structural glass tiles (made of Vitrolite or Carrara Glass) in black, mint green, and white, arranged in a geometric pattern leading to a prominent, parapeted ziggurat motif above the projecting marquee. The marquee overhang was adorned with aluminum trim, black back porcelain, and red, yellow, and white neon lighting. Recessed from the street beneath the marquee overhang was a small box office decorated in a chevron pattern. Entry doors were located well behind each side of the box office, with an ornate entrance floor in a sunburst pattern of tan, mint green, and white terrazzo leading to the lobby doors. Local tradition holds that Hamby and Winkler selected “997 spring-edge upholstered seats” to maximize revenue while avoiding a tax on venues with more than a thousand seats. At least two of the seats were known colloquially as “fat seats,” allowing two individuals to share a single seat. Ever the efficient entrepreneur, W. R. Winkler built his showcase to house other tenants as well, including the Appalachian Sandwich Shop (sometimes known interchangeably as the Appalachian Soda Shop, and managed by John L. Yount) on the west side of its first floor façade; the Home Electric Company (J. S. Tilley, manager) on the east side of its first floor façade; and the Lillian Mae Beauty Shop (Lillian Mae Reichert, Claire Pittman, and Blanche Wooten as operators) located behind the east stairway entrance to the second floor of the building. This east staircase led to yet another group of tenants on the second floor, including a dentist and an optometrist. A separate residential apartment was also available to tenants on the second floor. The Appalachian Theatre also had a very small part to play in the civil rights movement of the 1950s and 1960s. The theater started out as a whites-only theater, but when new manager Robert Agle arrived in 1948, he changed the rules, making it a segregated theater permitting black seating in the balcony—a fairly progressive move for a small, conservative mountain town in the South. Local tradition holds that when Agle woke up one morning in February 1960 and read the news about sit-ins at the Woolworth’s lunch counter in Greensboro, he came to work and announced to staff that the theater would no longer have segregated seating. The Appalachian Theatre experienced another round of intrigue in the form of a devastating fire on Saturday, January 21, 1950. Ignited by a defective popcorn maker that was left unattended by a teenaged theater worker named Bill Jones, the fire began just as the afternoon matinee—Gene Autry’s Riders of the Whistling Pines—was underway. Everyone got out safely, but the damage to the interior of the theater was devastating, with the roof collapsing into the auditorium. To cope with the damages to the upper walls and a collapsed roof, and to save money on heating in the renovated theater, Winkler installed a barrel roof to replace the tiered roof of the original. He then hired Harris F. Ragsdale, an interior designer from Atlanta, to complete renovations to the décor of the Appalachian. New Art Deco sconces, which still survive, replaced the old fixtures. 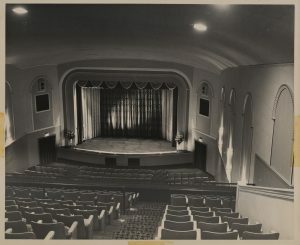 Winkler also expanded the stage, giving it a curved apron that jutted out from its original flat edge, while the Statesville Theatre Corporation supplied a new Starke Cycloramic Custom Screen, which allegedly offered a brighter and more consistent image because of the “satin smooth” surface of the screen. As a fire prevention measure, Winkler further instructed that a small, brick building be constructed at the rear of the theater to house the popcorn machine. Large-format projection was both a boon and a curse to the theater. Stage shows ended by the early 1950s as a result of the new screen, and the theater began a long, steady period of decline, first embracing exploitation and monster features in the 1960s and 1970s, then becoming a second-run, dollar theater after that. Statesville Theatre Corporation sold the theater operations to Stewart and Everett Theatres in 1975, which renovated the theater into a two-screen venue in 1982. Carmike bought out the theater in 1986, operating it until 2007, when the theater finally closed. A developer purchased and gutted the theater in 2008, then promptly fell into bankruptcy. The Town of Boone bought the building in 2011, then sold it to the Appalachian Theatre of the High Country in 2013. That group has been working to recreate the original façade and renovate the interior of the building since then. A late Summer 2019 reopening is anticipated. Portions of this text are taken from “History of the Appalachian Theatre” by Gary Boye, Craig Fischer, Frank Mohler, and Eric Plaag, as well as the forthcoming Downtown Boone Historic Resources Survey Report written by Eric Plaag.